I led Mountaineers groups to trek through Peru's Cordillera Blanca in 2014 and Cordillera Huayhuash in 2016. After experiencing some of the most famous trekking adventures around the world, these remain two of my very favorites. I invite you to join me on a photo journey from these two adventures at our next Walking the Wild presentation on April 24 at the Seattle Mountaineers Program Center. This is the tenth event in the Walking the Wild presentation series, jointly sponsored by Seattle and Foothills Branch Hiking Committees, which celebrates extraordinary trekking and backpacking adventures by Mountaineers members with stories, photography, and information for other members to add those same experiences to their life list. If you've been dreaming of trekking in the high Andes of Peru but wished you could learn more about the routes and how to plan a trip there, or wondered what the place looks like where Joe Simpson made his epic struggle to rescue himself after his fall from Siula Grande in Touching the Void, this presentation is for you. Join me for a photo presentation, plus information about logistics, gear, and guiding services. 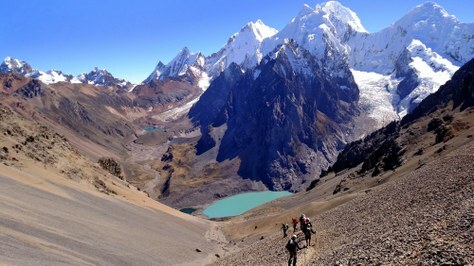 After you see our photos from these treks they will move toward the top of your Life List! We hope you can join us at this fun and informal event! Tickets are $10 for members, $12 for general admission. Snacks and beverages will be available. Open to Mountaineers members, guests and the public!